Bright days that grow cool and call for warm knits as we walk under leaves that curl red and gold in a soft wind. 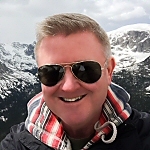 As friends come together to mark the end of summer and anticipate coming festivities, there is one warm treat that has come to stand above all others – one that Starbucks gets asked for again and again and again because people love it so much. 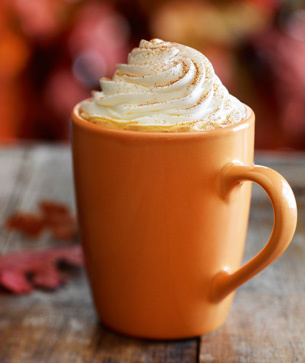 Starbucks says the Pumpkin Spice Latte is fall’s favorite drink. Signature espresso blended with the unmistakable spices of fall – cinnamon, nutmeg and clove – smooth with steamed milk and topped with delectably sweetened whipped cream. Please note, this is NOT a sponsored post. It is simply an ode… a love letter of sorts… to the holiday season that’s finally heading our way. A celebration of the passing of hot summer days, and dreams of snuggling by a fire a toasty beverage in hand. Aside from previously mentioned fall goodness, I love a good Eggnog Latte!! Whoever thought those two would be a match made in heaven!! 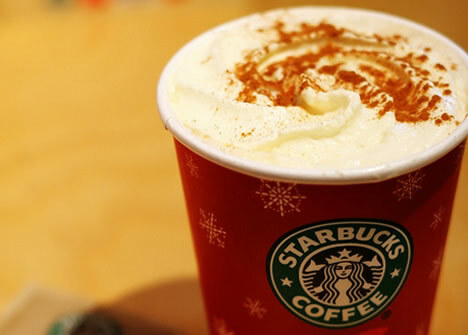 Oh, wow… Heather, I just visited Starbucks website and saw this picture of your fav Cinnamon Dolce Latte. That looks REALLY good. Must give it a try next! I love, love, love the pumpkin spice latte. It is still 110 here in Phoenix, but as soon as they arrived, my latte-love affair picked right back up where it left off last winter. I like the gingerbread, but pumpkin will steal my heart every time! Hi, Angie! I guess for me it’s all associated with childhood comfort food memories and fond feelings for the holidays… all of them from Halloween to Thanksgiving to Christmas! You mention gingerbread, and that immediately reminds me of my mom bringing me a fresh hot slice on a plate with hard sauce when I was a kid in Holland. Thanks so much for stopping by! I don’t believe that I have ever had the Pumpkin Latte. I have had the Eggnog Latte though and those are absolutely divine! Drink one for me my friend! Yes, someone else mentioned the Eggnog Latte isn’t it? It’s one of their winter treats. Sounds good to me, M! I am not one for coffee…but I know that once this time of year comes around that exact beverage will be running through The Man’s veins as sure as his DNA is what makes Bubba fall down so frequently. Oh how I love Fall! LOL… you are too funny. Thanks for sharing. Do you drink tea or soft drinks… or simply forgo these things all together? I LOVE the Fall, too! I’m glad you enjoyed it, Shannon. There is something about how smell ties to memory. I think that’s part of the appeal since it conjures memories of our childhood celebrations like Thanksgiving and Christmas? I tried the Pumpkin Spice Latte a couple days ago and it was very sweet. I’m wondering if they made it wrong. Lately I’ve been getting the salted caramel mocha and it’s delicious. Yeah, I’m not so big on super sweet drinks. If I get one at all, I tend to ask for half the syrup. I saw they had some “salted” beverages, but haven’t tried them yet. Their good, eh? I like those, but every once in awhile I want an iced one, since it’s still so hot in FL! As I mentioned to Kelly above, it’s finally cooled off here in Texas. Sorry, a couple of these comments got lost in the spam file. Hope you’re weathers nice now, too, Barb? Yummy! That sounds totally delicious, the best choice for cold halloween mornings! I cannot wait to give it a try the next time! Thanks for the idea! You’re very welcome, Angela. Have a wonderful autumn!